The DDJ-SB2 takes you beyond control. Not only does it boast all popular features from the DDJ-SB, it also adds some amazing new pro-DJ functions. Hitting the decks has never been easier and more intuitive – even for first-time DJs. This controller has been upgraded with 4-deck control and dedicated buttons to switch between channels effortlessly. Plus a trim knob and level meters to master the input volume, and Pad Trans beat effects will uplift your DJ skills in no time. By hitting the Filter Fade button, you can add two high pass filters to the crossfader – so both volume and bass filter can be manipulated using just one hand. Seamless mixing becomes effortless. Download Serato DJ Intro, connect your computer to the controller and start DJing. You can easily organise and build music libraries or integrate songs from iTunes. Just drag a track to the deck, set and trigger cues, loops and samples, and apply basic FX. 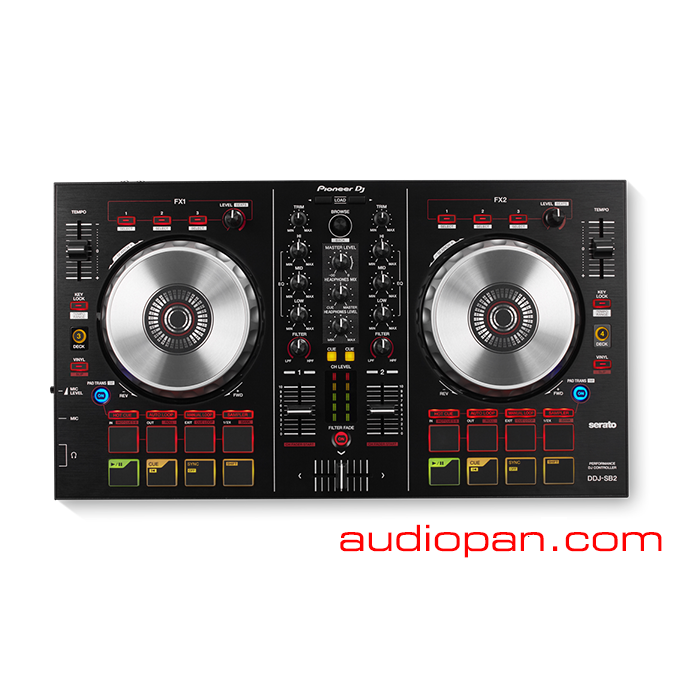 The DDJ-SB2 is USB powered, so you can simply connect the controller to your computer using the provided USB cable – there is no need for additional connections. The DDJ-SB2 is constructed from premium materials and audio circuitry. The robust build ensures durability, while the distinctive styling and aluminium jog wheel deliver a professional feel.